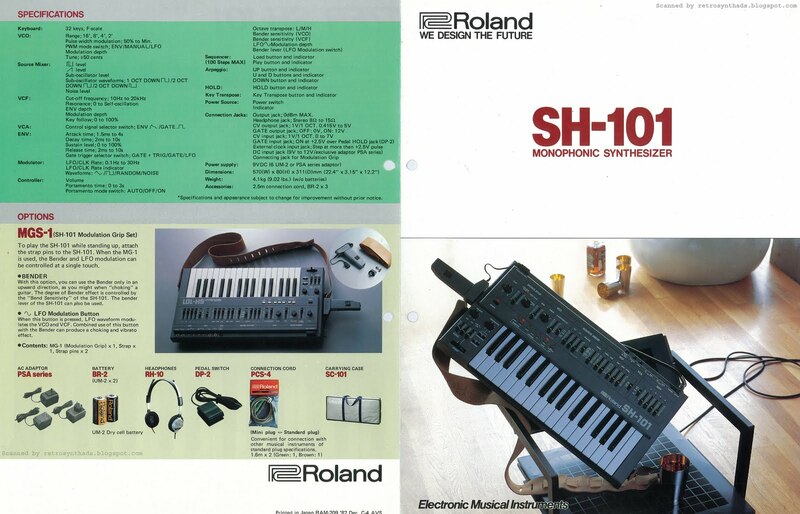 Roland Jupiter-6 "We Design The Future" four page colour brochure from April, 1983. Yeaaah... 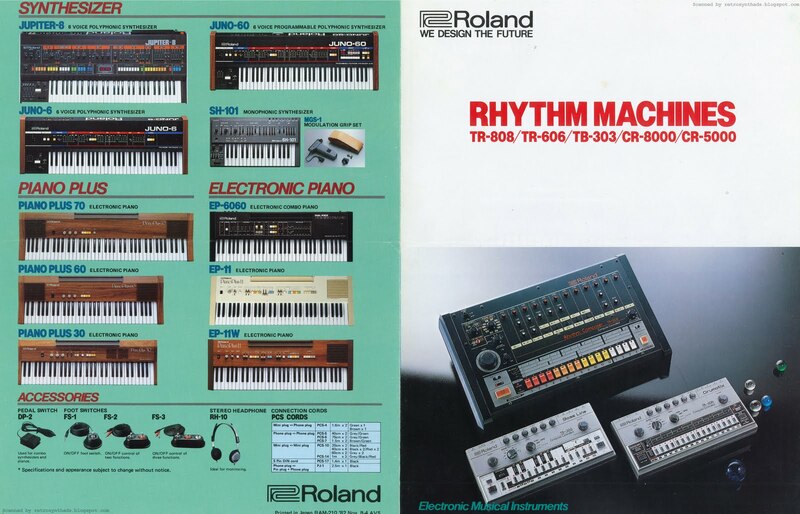 I got a bit of a buzz going for Roland at the moment. As much as I'm a diehard analog gearhead, I really am digging their new AIRA products. 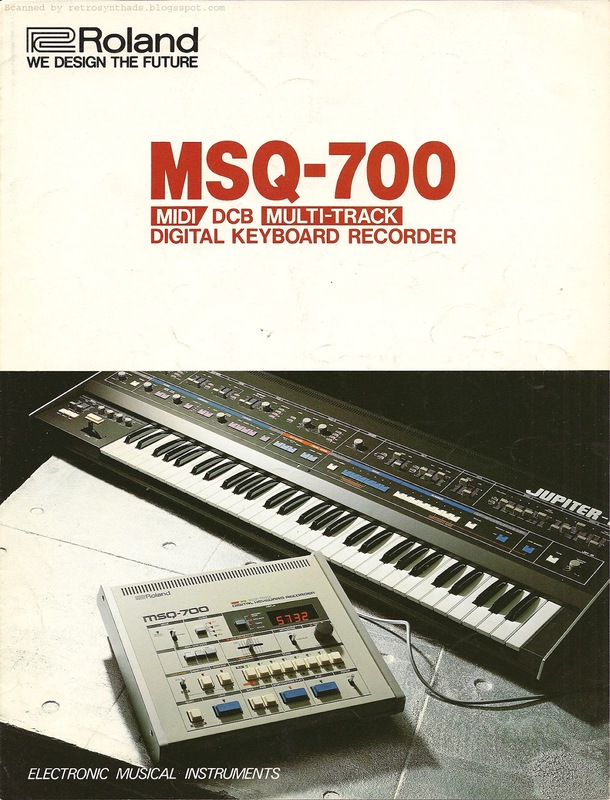 Normally I would knee-jerk to anything new that is supposed to resemble the old, but after my knee-jerk to the Korg MS-20mini, I decided to take a wait-and-see approach. And I'm glad I did. 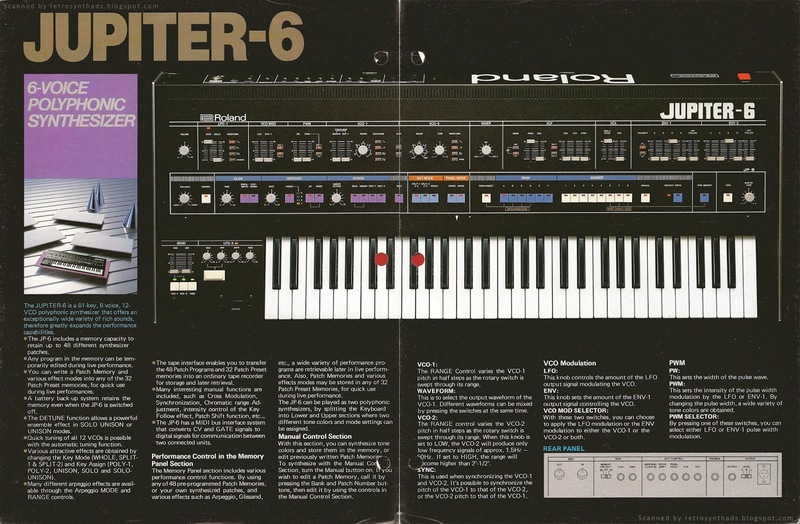 And thus the reason for posting this Jupiter-6 brochure. I love that thing. 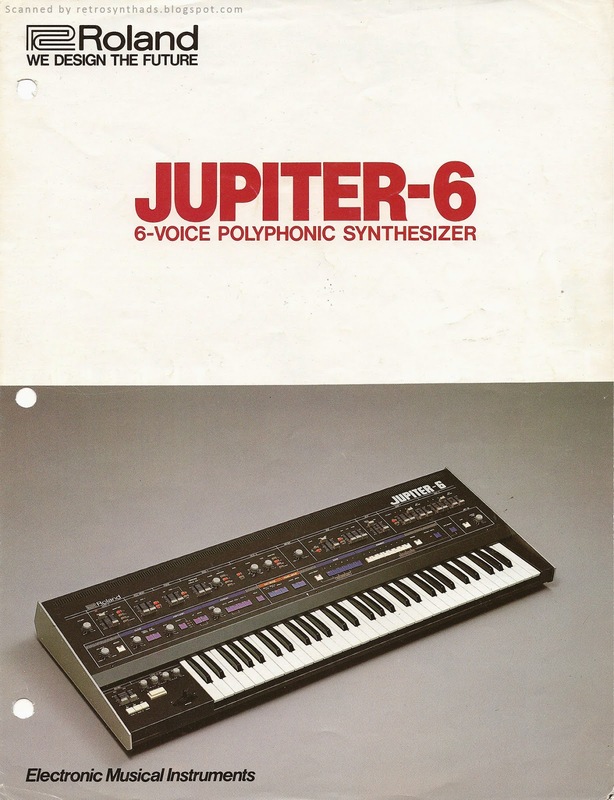 None of those brochures disappoint, and neither does this Jupiter-6 brochure. Except for the hole punches, but that's not Roland's (or my own!) fault. People have to stop hole punching these things. Those inside pages are especially nice - a great big photo of the Jupiter 6 and a nice diagram of the back panel too. But really intrigues me is that purplish call out box on the left side that has the rectangles and cones sitting on something that resembles the slat wall that holds up all my keyboards in my studio. Why isn't THAT the image on the front cover? That would be more aligned with the other more creative front covers of the other brochures. That back page is also great. 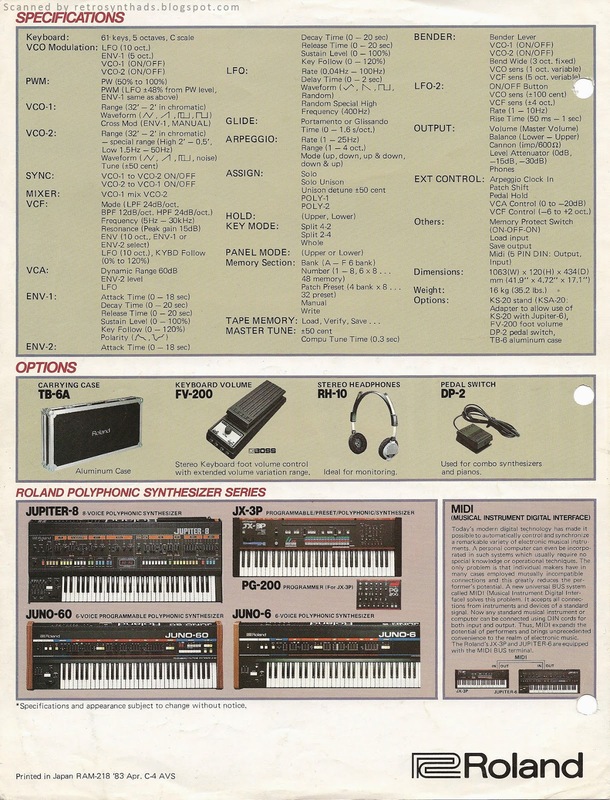 The specs are always nice to see clearly laid out, but its the images of the other synths currently available from Roland that I find useful as a way of knowing exactly what gear Roland was still officially selling as of April 1983 when the brochure was printed. Helps with those reference timelines. Anyways, enough about the brochure. It's awesome. We all know it. And as you might have guessed, I find Roland's new AIRA gear just as awesome. I mentioned near the beginning of this blog post that the first thing I did when I got my Roland AIRA TB-3 and TR-8 was turn them on and set them up side-by-side with the originals for a little simple testing. Nothing as detailed as you'll find elsewhere online. Just something to give me an idea. 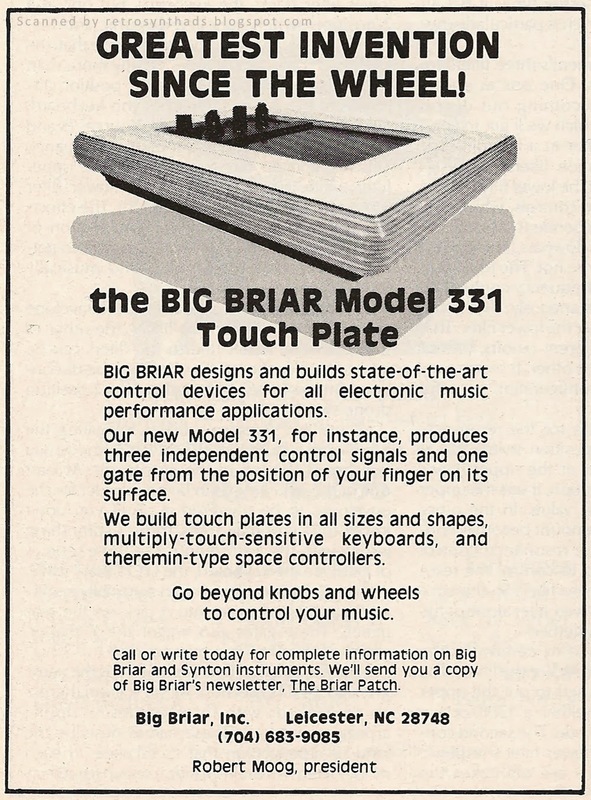 Now, if you recall from my last blog post on the Big Briar Touch Ribbon Controller, I had been side-tracked from creating my first Retro Synth Ads video. But I'd done all the leg work to figure out how exactly I was going to set up the camera, get audio from the mixer into the mic jack of the camera, etc... . So, I decided to finally get my first video up and running last Thursday evening with that test. For my first YouTube video, I think it turned out okay! Next up was a little test of the TB-303 against a few of the different clones I have - the XOXBOX, the TB-3 and the TT-303. I programmed the same pattern into all of them and turned on the video camera. In my opinion, all of them do an okay impression. The TB-3 is a little more bassy, and the TT-303 tends to loose the growl during long slides. But both of those may be user-error. Remember, there were just simple tests after very little time with the machines. Overall, with effects added in, very few people would know the difference. 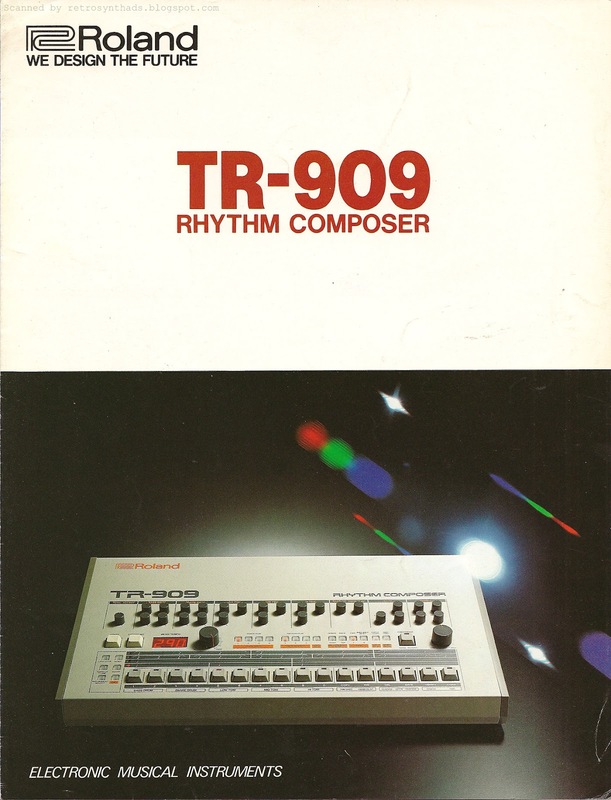 The thing I love about the TB-3 is that it goes above and beyond the classic "303" sound. So, I took out both of them (yes, I bought two - don't judge me) and decided to try and push them outside there normal 303 comfort zone. I uploaded that final video on Friday night. Accompanied by the TR-8 as well as my MC-202 for a bit of vintage flavour, I just created a few small riffs and started the recorder. Not too shabby for 10 minutes of work. All in all - I'm digging the AIRA line and the technology behind them. And for the record, Roland isn't paying me to say that. 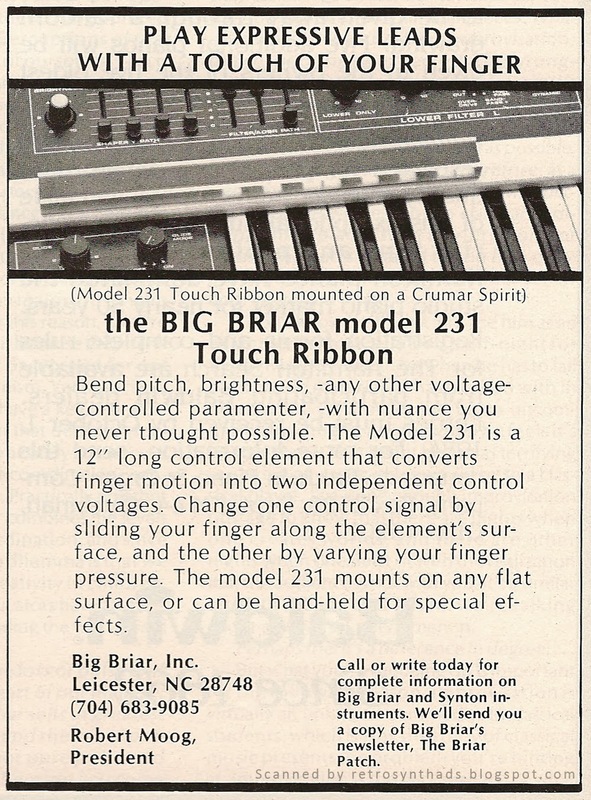 Big Briar Inc. Model 231 Touch Ribbon "Play Expressive Leads With A Touch Of Your Finger" black and white 1/4-page advertisement from the bottom-right corner of page 24 in the April 1984 issue of Keyboard Magazine. Here, for your enjoyment (and mine! 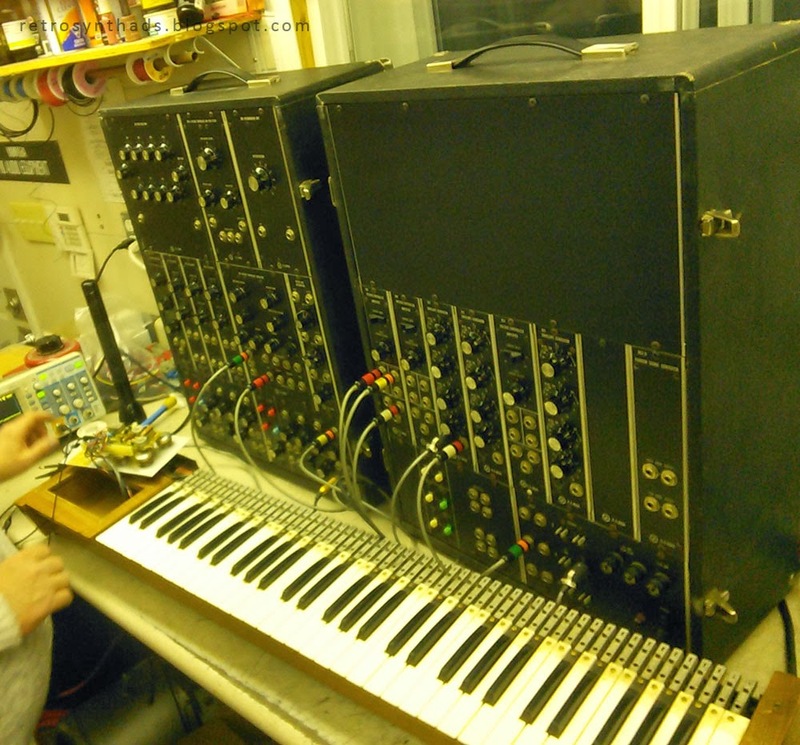 ), is another Big Briar (Bob Moog, President and owner) advertisement. 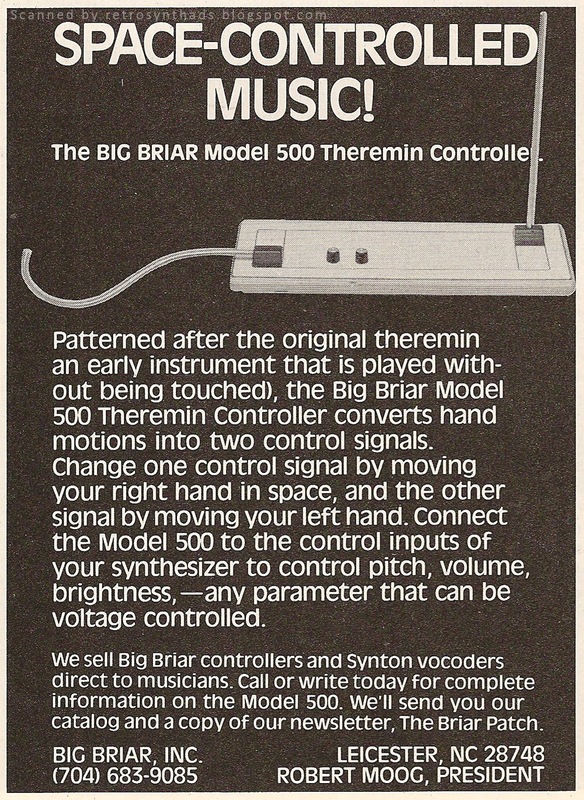 Back in January I had post two other hip and happenin' Big Briar alternative controller 1/4-pagers - the Model 331 Touch Controller and Model 500 Theremin Controller. 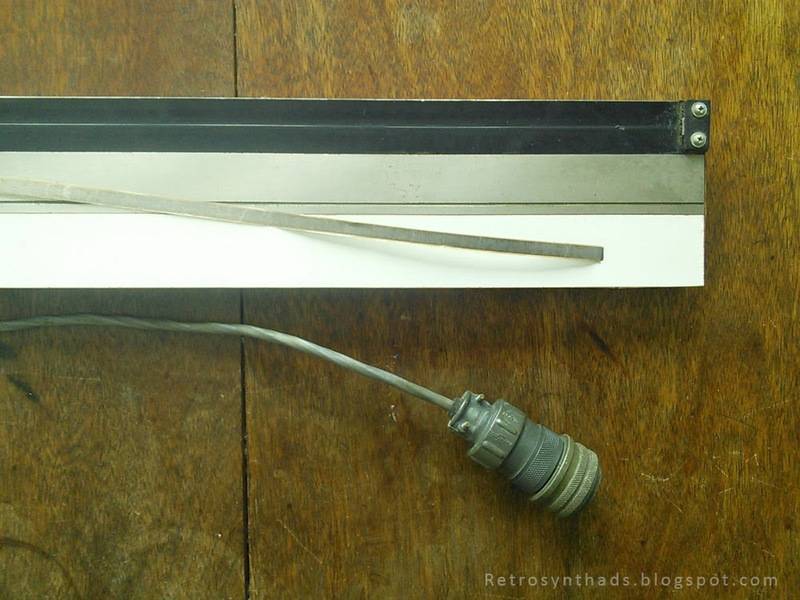 This time around we got your classic touch ribbon controller - with two independent control voltages. One by sliding your finger along the ribbon (usually pitch) and another by varying finger pressure. Nice. The actual touch ribbon device is hard to make out in the ad photo, but a few attempts at Google searches didn't bring up any other images of the 231. Boooo! One of the main reasons I was really excited to post this ad was that I was going to make my first real Retro Synth Ads' video using my Moog 956 ribbon controller and my Moog Modular that just got serviced by a tech that I recently found in the city that does great analog synth work (techs are getting harder and harder to find in my neck of the woods). But, believe it or not, as I was carrying the ribbon controller between rooms, I accidentally caught the ribbon on something and snapped it right at the end connection point. Gah. Dumb - and probably expensive - move. So, instead of a lovely video, I thought I would explain why I finally had to take my Moog Modular into the shop in the first place. First, I gotta say, I've had very very very good luck with my Moog Modular over the years. The thing is older than me and has been to the doctor much much less. But, last time I set it up for some super-fun-Electribe-sampler-time, I noticed that the keyboard wasn't triggering the gate within the modular. CV was getting through. Just not the gate. Now, before I get into the problem-solving aspects of the modular, I should probably explain a bit about how controllers are connected to this beast of a beast. This modular can connect up to three controllers (keyboard, ribbon, etc) through the back of the main cabinet. 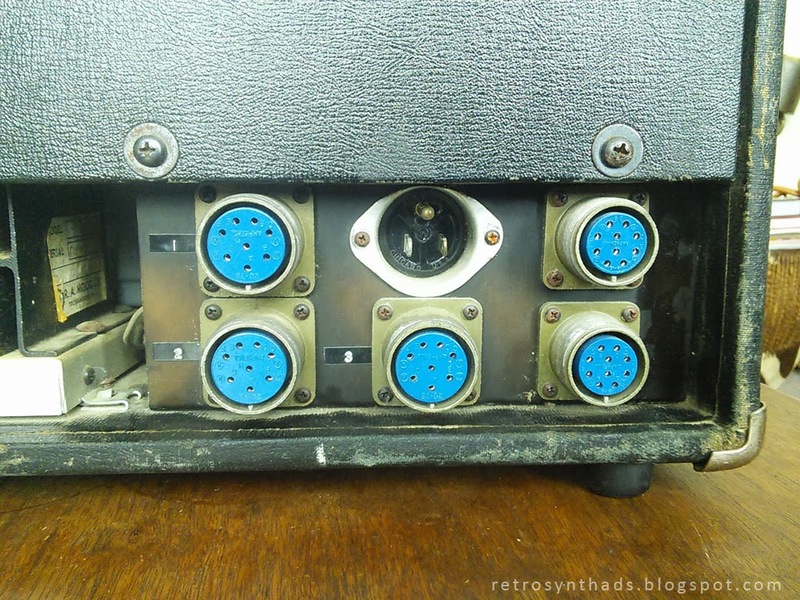 The three connectors are rather large 8-pin "military" Amphenol connectors that look right out of a Terminator movie. My tech guy was actually a little surprised when he saw them. He is a calm dude, but I noticed his eyes get slightly wider when he saw them. 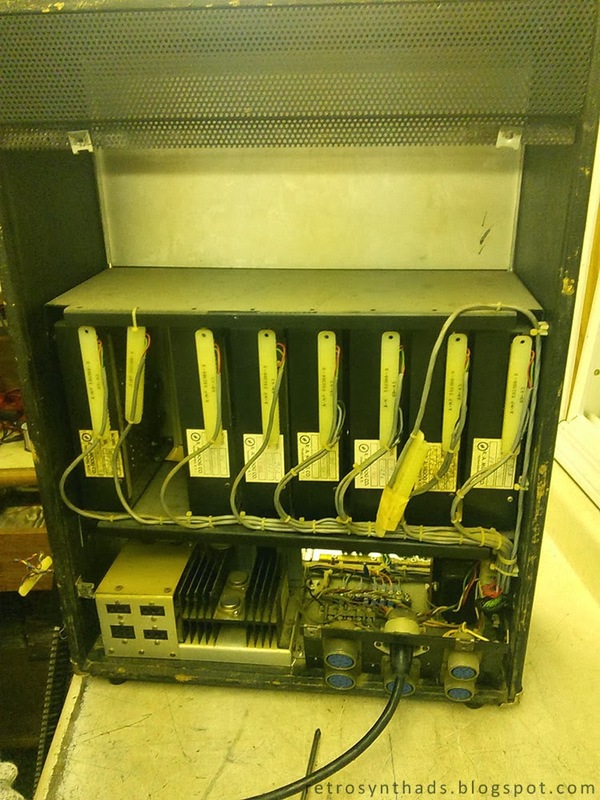 Below is a photo of the back of the cabinet with the connectors labelled 1-3. The other two 10-pin connectors push power to other cabinets (I have one extra cabinet, and you can read more information about my particular modular including its modules in this blog post. 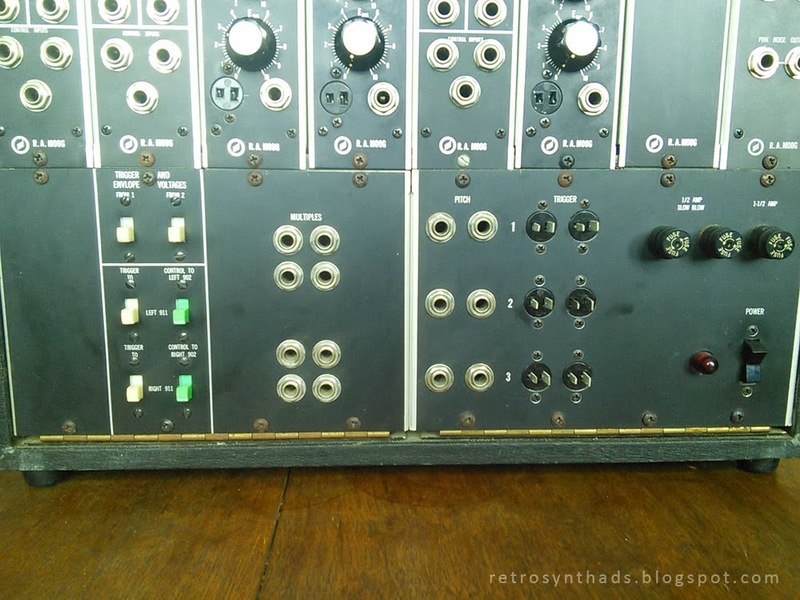 When you connect a keyboard or ribbon controller through the back of the machine to one of the first two connectors, you can then use the 911-902 coupling switch panel on the front of the modular to direct the particular controller's cv and gate to either the "left" or "right" VCA and "left" or "right"envelope without the need of patch or trigger cables. In the photo below, you can see the switches on the left side of the modular. So, for example, if you have the keyboard connected into controller #2 on the back of the cabinet, you can then use the white switches to route the trigger of #2 to either the "left" or "right" envelope and use the green switches to connect the selected envelope generator to the "left" or "right" voltage controlled amplifier. Like I said, a few less patch cords and trigger cables getting in the way. In the photo above, on the right side of the front panel, you can also see the "pitch-trig" panel. The three sets are direct outs for the "pitch" (CV) and "trigger" outputs of the connectors at the back - so that you can have full modular control of the signals to any module using patch and trigger cables. Okay, now that we know the background, back to the problem: gate wasn't getting from the keyboard into the triggers for 1, 2 or 3. CV was working fine. I'd tested all the actual modules before taking it in and they were working fine on their own, so we figured the most likely culprit was the keyboard. Familiarizing ourselves with the schematic diagrams for the 950 Keyboard Controller, he opened the keyboard up first. After a bit of testing, and a few missteps, we realized that the keyboard was actually functioning fine. A few electrical components that looked a little iffy were replaced and we closed 'er right back up. Logically, we figured that there must be a problem with the cabinet itself, so we opened 'er up next. First from the back, and then the front-bottom. 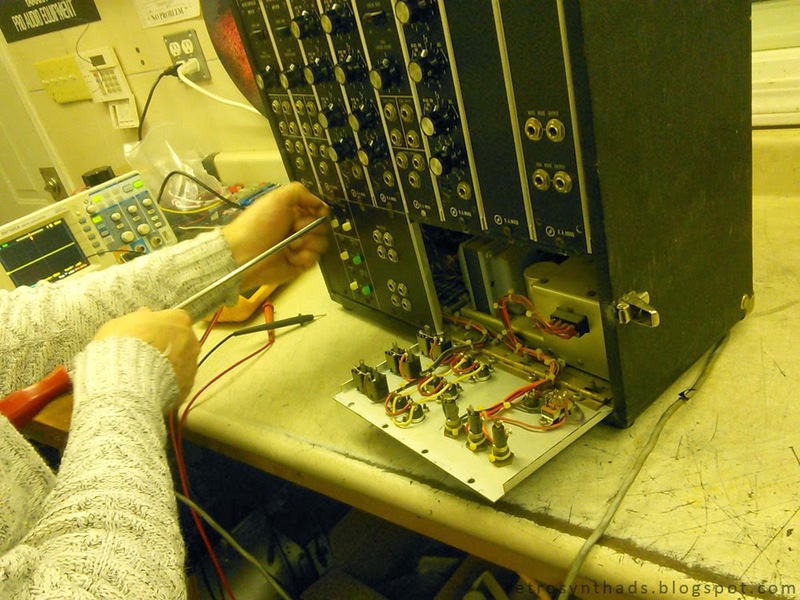 Again, familiarizing ourselves with the various schematics, he began testing all the connections to ensure that correct signals and voltages were getting through the system. In the end, he couldn't find anything wrong in the cabinet either. All signals and electrical currents were traveling exactly where they were supposed to within the cabinet. And all the signals and electrical currents were traveling where they were supposed on in the keyboard. And then we both kinda turned our heads towards the connector cable itself. I think we both mentally slapped ourselves in the forehead. Sure enough, when he opened up the connector he found the wires stripped and tightly twisted around each other from my obvious continued mishandling during set up and take down over the years. 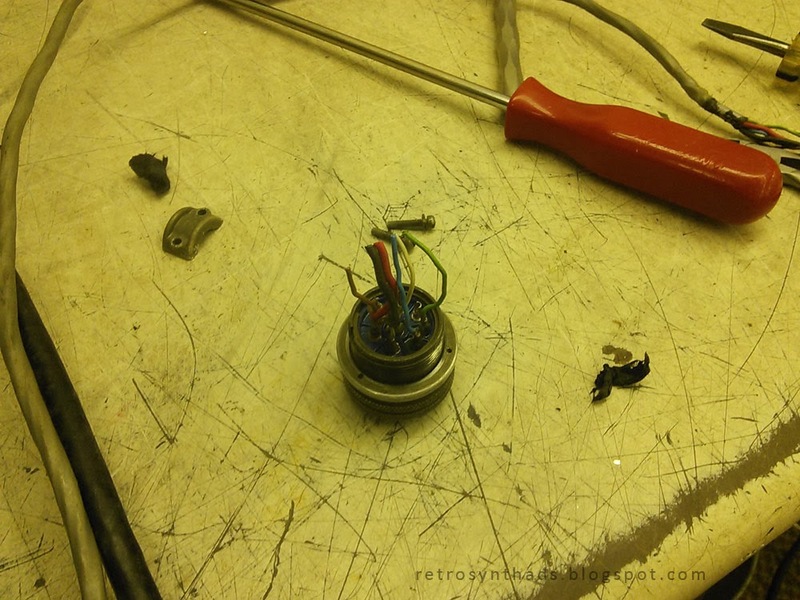 Below is a photo of the connector after he cut the end of the wires off. After a quick stripping and re-soldering of the wires, everything worked like a charm. It's always the little things eh? But at least we got to test a lot of the system and determined everything was still running smoothly. Time to go on the hunt for more Moog modules. Korg "The KORG MIDI system" two-page colour advertisement including the Poly 800 and Poly-61M synthesizers, EX 800 expander module, RK 100 Remote MIDI keyboard, KMS 30 MIDI synchronizer, the 4 Track sequencer and Music Scoring software from the inside front cover and page 2 of the October 1984 issue of Keyboard Magazine. 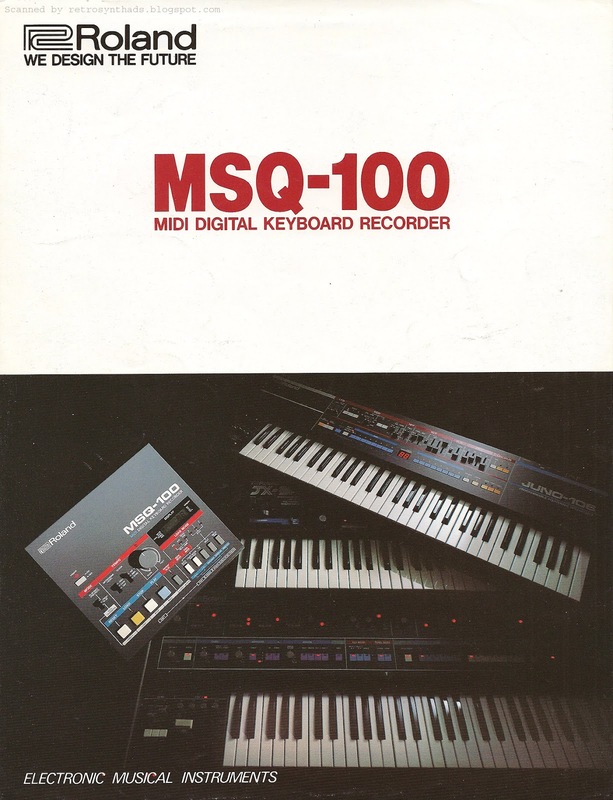 I didn't post this ad because it appeared on the inside front cover of Keyboard magazine from October 1984 through January 1985 before Korg replaced it with their DW-6000 ad in the February 1985 issue. 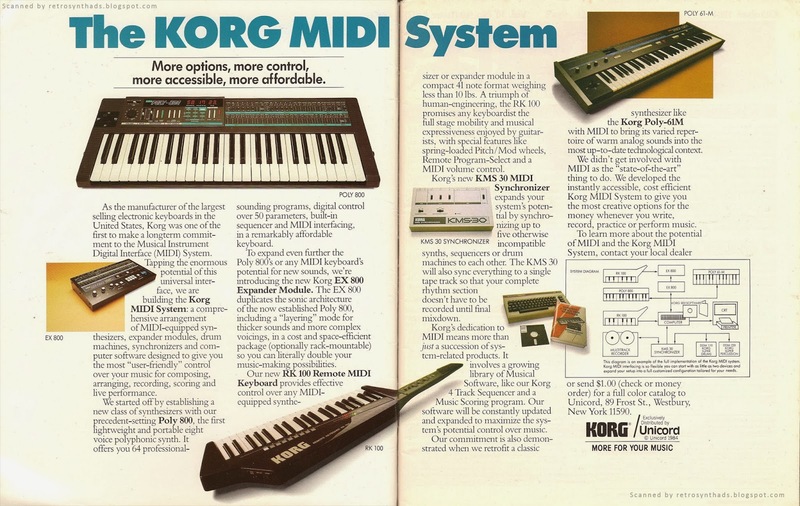 I didn't post this ad because of the awesomeness that is this Korg MIDI system that includes the Poly 800 (I own the version with the reversed coloured keys!) - or the EX 800 that is so awesome that it takes up waaaaay to much space in a rack! 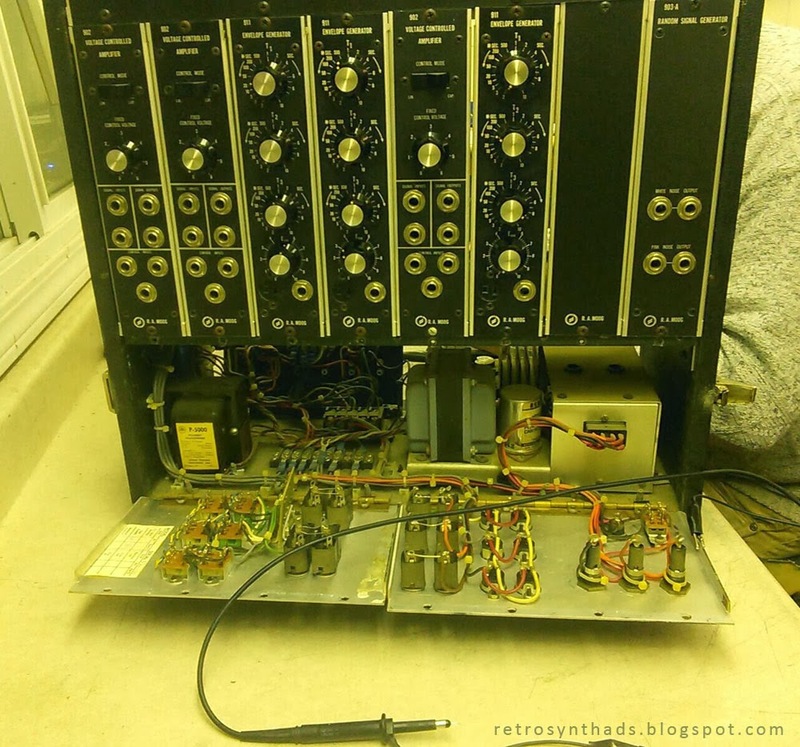 I didn't post this because of the reference to the DDM-110 and DDM-220 drum machines that only sync to DIN-sync in that lovely little "system diagram". I posted this for one reason, and one reason only. I'm still fixating on KORG's announcement of the ARP Odyssey!!!!! If you live under a rock or haven't read my last post or two, maybe you didn't you hear... Korg is resurrecting the ARP Odyssey. Didn't see that coming - and anyone not intimately involved with the project who said they did see it coming - well - they just didn't. Punch them in the neck for lying. Say it's from me. As far as I'm concerned, that news blew everybody and their favorite synthesizer news outlet out of the water. And, interestingly, it was one of the first times ever that synth news hit me through *Facebook* before any of my other usual news sources. As a marketing and communications "professional" (or "hack" as some [many] of my colleagues might call me), I'm intrigued when news spreads that quickly. I get a serious kick out of watching marketing and social media teams jump into action to get their message out there. Especially when its such interesting, out-of-the-box, unexpected news such as this. I can image Korg's marketing peeps huddling together for weeks on end prep'ing their strategic communications plan. Hovering over the corporate and communications objectives. Tweaking their key messages and tactics for hours with a fine-toothed comb. Now I thought I recalled getting the news in my Facebook news feed directly from Korg, but when I went back to check, I couldn't find a single post about the topic on either Korg US or Korg Canada's Facebook pages. Looking at the Twitter feeds for Korg USA, Korg UK, and Korg Canada, they all seem eerily silent about this big news as well. Not even a simple link back to the news release. Huh? Is it just me? I question my findings basically due to my combination of lazy and not-that-good-at-searching-social-media. So, check it out for yourself. It kinda makes sense though. The new Odyssey isn't coming out until September 2014 at the earliest (unless, of course, Korg surprises us *again*, and drops it in the middle of the summer. And, *that* wouldn't surprise me). Point is - there isn't a lot more information to push out there yet. In other words, the product isn't imminent. Heck, after the whole Roland TB-3/TR-8 thang, I'm betting that synthesizer hardware leaks are almost as lucrative as Apple iPhone leaks. So, as far as I'm concerned, when it comes to Korg's reissue of the the ARP Odyssey, it wasn't a matter of "if" the news would leak, but "when". Maybe they just wanted to beat the rumor mill? And the best way to do that is to get the news release out there and then let the synth community do the heavy lifting. If you've noticed, most, if not all of those articles, link directly back to the original Korg news release. Not to prototype videos. Not to teaser articles from Korg. That dang Korg news release. There isn't much else available officially from Korg. But Korg has plenty of time to get the package ready - the machine isn't due out for another six month. And I'll be waiting with my wallet open.